The cost of your new bathroom can vary based on many factors including the type of materials and accessories selected for your bathroom. 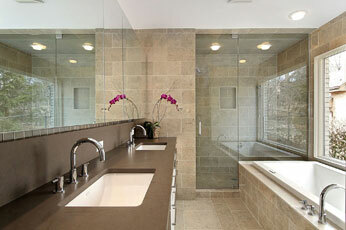 We offer a range of multiple bathroom renovation packages, and we also build Custom bathrooms too. Our customers' bathroom styles & sizes are always different, so we don't mislead people by providing a one-price-fits-all solution. By uploading photos of your current bathroom via our contact form and specifying roughly what type of accessories you want, we can then provide you with an estimate over the phone. We have an experienced team dedicated to providing mobile in-house quotes. We encourage you to schedule an appointment at a time that suits you, so we can properly assess the scope of work required to renovate your bathroom according to your specifications. Just bring your design drafts into one of our showrooms or discuss your ideas with a Fred Rose consultant during a free in-home visit. Contact Fred Rose on 1300 143 733. Where are your Sydney showrooms located? Our bathroom showrooms are located in Fairfield and Padstow. Feel free to drop-in and speak with one of our professional team members and take a look at our gorgeous bathroom displays and accessories. You can use the basin and vanity, sit in a new bathtub or stand in the shower area, and get a feel of just what it would be like to have such features in your new bathroom. To see the location of our showrooms visit our bathroom showrooms page and use the zoom feature if required on the dynamic Google map. Our Fairfield showroom location: 3/203 Foray St, Fairfield, NSW 2165. Our Padstow showroom location: 37 Gow St, Padstow, NSW 2211. What payment or finance options do you provide? Fred Rose Bathrooms offers a variety of ways to finance your new bathroom renovation project. We accept payments via most major credit cards, cheque, cash or direct deposit. If you have any questions about financing contact us here. Does Fred Rose use external contractors? At Fred Rose we employ over 50 staff with varying skills and attributes ranging from courteous design staff to professional licensed tradespeople. Whilst we do use specialised companies like glass suppliers (Palmers Glass) we never outsource your work to third party contractors to carry out the construction like some bathroom renovation companies. You can be assured knowing that all of our staff are constantly improving their already highly refined skills via our in-house continuous improvement programs. Your bathroom renovation will be project managed by highly trained bathroom consultants so your renovation project stays on track and you can enjoy your bathroom sooner. Measure: We visit your bathroom to get the exact measurements and dimensions of your bathroom including wall space and flooring. We then use these metrics to design beautiful space optimising layout plans. Design: The expertise of the Fred Rose bathroom design team and our attention to details are what sets us apart from our competitors. We consider every facet of your bathroom to be of equal importance, and we give each feature the attention it deserves. From the precise positioning and installation of your cabinets and toilet, to the beautifully finished shower recess, our work is flawless. We will provide you with a completed visual overview before we start so you'll know exactly how your new bathroom will look. Finishes: We help you coordinate all of your bathroom accessories including bathroom vanities, tiles, bathtubs, and plumbing requirements. Budget: Our consultants will design and create a bathroom to suit your budget whilst delivering a beautifully styled modern and functional bathroom renovation with all the luxuries and features that you've dreamed about. What should I expect during my renovations? Step 1: Your old bathroom will be carefully stripped out and all items will be disposed of in an environmentally-friendly manner by our experienced team using company owned vehicles as opposed to unsightly and unsafe Skip bins. Step 4: Repairs to the bathroom walls in preparation for tiling. Installation of our proven Copper Tray Shower System as well as membrane. Waterproofing is then carried out by our experienced Master builders in accordance with the waterproofing procedures stipulated by the Building Code of Australia. Fred Rose staff undergo ongoing specialised industry training that helps to make our team the best bathroom renovators in Sydney. Our highly trained staff members are responsible for making Fred Rose one of Sydney's largest bathroom renovation companies. Our staff members excel in providing exceptional levels of solution-oriented customer service. The impeccable finishes and results we're able to achieve are reflective of our teams core values and driving ambition. At Fred Rose, our purpose is to build spectacular bathrooms whilst ensuring complete customer satisfaction, and we accomplish this by consistently exceeding our clients highest expectations. With a mutual commitment to exceptional quality, our dynamic crew work together harmoniously to provide our customers with the best craftsmanship possible for their homes. How soon can work commence on my bathroom? This of course depends on many factors including our work volume, the size of your bathroom and the availability of certain materials so please contact our bathroom design professionals on 1300 143 733 for more info. What Happens When I need to use the Bathroom? We have developed a systematic approach to bathroom renovations ensuring you experience minimal downtime of bathroom utilities. During this period, a portable Ensuite is available for hire that comes delivered to your home or even inside your garage with showering and toilet facilities. This portable type facility is used at major corporate style events and is quite comfortable for use for the entire time the bathroom is out of use. The portable Ensuite is equipped with hot water and will be connected to your main sewer line during the construction of your new bathroom. Where do I start on my bathroom renovation? Before the bathroom renovation begins, it’s best to evaluate your space and the functioning items and features you require in your new bathroom. Take notes of your ideas and goals and bring them into our showroom to discuss your renovation project. If possible, take some photos and together we can develop a design that will suit your needs and create a beautiful new space that will compliment your home. Fixtures like towel rails, soap holders, etc. Optional extras such as backlit mirrors, etc. With access to all the leading Australian and international brands including Caroma and Fowler, Fred Rose is your one-stop-shop for all your bathroom renovation requirements. When it comes to choosing tiles for your bathroom floor and walls, the sheer magnitude of choices can sometimes be overwhelming. We've made things easy and have collaborated a fantastic selection of tiles to choose from, so you'll quickly find the perfect tiles for your home. From Australian made tiles to imported tiles, we have what you need with a choice of materials such as stone, marble and ceramic. The Fred Rose team have a wealth of experience, and we know exactly what styles and types of tiles work well in bathrooms. We love nothing more than helping clients come to the right tile decision, so their bathrooms looks great and is as easy as possible to keep clean. Can we design & build your ensuite? Yes, we most certainly can! From our perspective, an ensuite is just a smaller bathroom. Although space restrictions can make them challenging, every element of an ensuite renovation is just the same as a main bathroom. One of the bests ways to save money on your renovations is by building your main bathroom and ensuite at the same time. Doing it this way ensures that both of your bathroom areas look beautifully uniform. Ask out staff for a free bathroom renovation quote by calling 1300 143 733. Do you perform Custom bathroom renovations? Yes, and these are one of our favourite types of jobs to perform because they allow us to express our creativity and challenge us. If you've seen a particular concept in a magazine that has caught your eye, then we can replicate that finish or put your personal twist on it. It doesn't matter what type of themed styling or customisations you have in mind, our highly skilled Master builders can replicate any bespoke design concepts or features you have in mind. You can learn more about Fred Rose's custom bathroom renovations here. Why choose Fred Rose Bathrooms? Why should I choose Fred Rose Bathrooms? When you choose Fred Rose Bathrooms, you're dealing with one of Sydney's largest bathroom renovation businesses that have been trading for more than 40 years. During this time, we've assembled a team of professionals who share our companies core beliefs and visions. Our expert team members work harmoniously to uphold our companies mission of providing exceptionally high-quality craftsmanship and customer service that exceeds expectations. When it comes to performing bathroom renovations in your home, don't take chances, just use the best. Visit us at our Sydney showrooms or contact us to arrange an in-home visit for a free consultation. You can also learn more about Fred Rose Bathrooms here. Can you visit me for a bathroom quote? Fred Rose has a team dedicated to providing our customers with free quotes in their homes. It's by far the most efficient to way for us to accurately evaluate the scope of work required to build your new bathroom. We will accurately measure-up your bathroom and provide you with a variety of ideas and design concepts to consider. Based on our assessments and the specifications you wish to have included, we will then draft a renovation plan and provide you with an accurate fixed price quote. Simply contact us on 1300 143 733 to book your in-home visit or if you prefer you can always visit our showrooms. What is the warranty on your bathrooms? Fred Rose offers a full written warranty on all of our bathroom renovations and all Fred Rose staff working on-site carry professional indemnity insurance for your peace of mind. For all renovations over $20,000.00, full home warranty insurance is in place. Cover is held with Master Builders Insurance Services. We are full members of the Master Builder Association (MBA), and the Housing Industry Association of Australia (HIA). Our long standing affiliations with these industry governing bodies are indicative of our integrity, commitment to quality and absolute customer stratification. What do our current customers say about us? With over 40 years building bathrooms in Sydney, Fred Rose Bathrooms has received some fantastic feedback from our satisfied customers which we are proud to share on our testimonials page. How long has Fred Rose been in business? Fred Rose Bathrooms has been building stunning bathrooms in Sydney for more than 40 years. We've managed to sustain and steadily grow our company by consistently delivering craftsmanship of the highest caliber, and providing a level of customer service that most businesses can only aspire to. Our business operatives are based on integrity, customer satisfaction, and hard work. When dealing with Fred Rose staff members, we're confident that you'll immediately realise you're dealing with a company that cares about quality and solution-oriented customer service. Husband and wife team 'Fred & Rose' started Fred Rose Bathrooms in the 70's and our company have since built thousands of magnificent new bathrooms and ensuites across Sydney's metropolitan areas. Get your bathroom custom built by Sydney's leading bathroom renovators with advanced features and accessories. Fred Rose will turn your bathroom into a place of serenity & peace for your whole family. Get in touch with Fred Rose Bathrooms by email, by phone, or visit us at our Sydney showrooms for a fast and easy quote on your bathroom renovation. Get expert advice from the best bathroom renovation team in the business.